Thanks to all our wonderful customers who came to our Winter Sale! 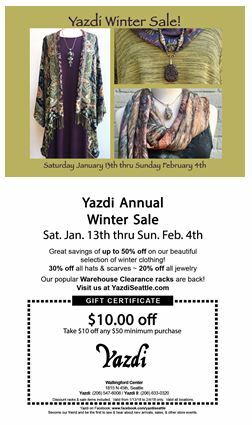 Our winter sale this year is Saturday, January 13 through Sunday February 4. $10 off coupons are at the sale for the asking! It is a really big deal, we only have two sales a year. The clothing is individually marked down. Savings are as much as 50% off! All scarves and hats are 30% off their season prices. All jewelry is 20% off! We will also have special “Warehouse Clearance Racks”. Previous Post10% Off on Jewelry through Christmas, a $300 Grand Prize Drawing, and a Look BookNext PostYazdi II is having a sale on sale items!